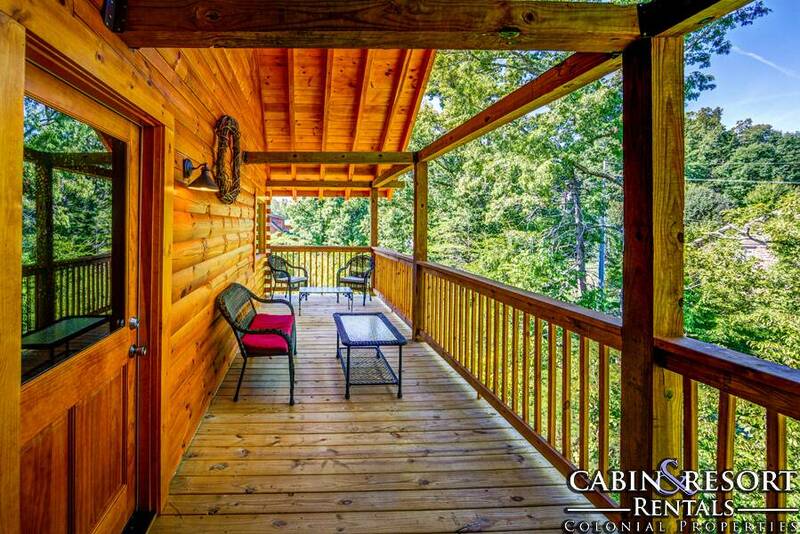 Welcome to Mountain Movie Inn in the Smoky Mountains! 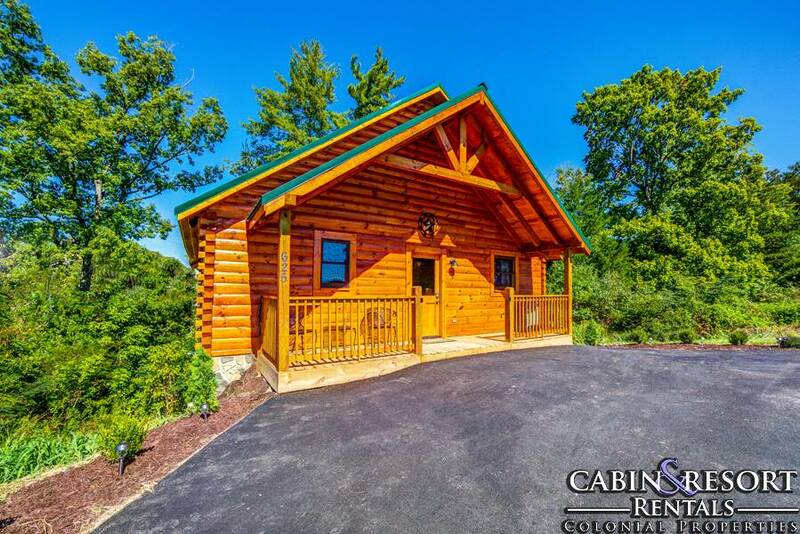 This brand new construction 2 bedroom, 2.5 bath Pigeon Forge cabin rental is absolutely unbelievable and ONLY 1 mile from Pigeon Forge Parkway! 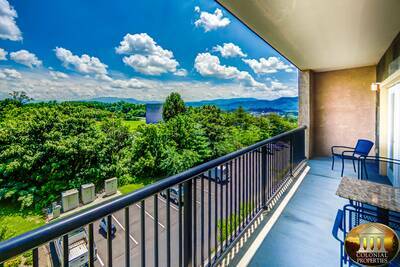 With a perfect in-town location, you’ll have quick, convenient access to shopping, dining, attractions, theaters and entertainment! 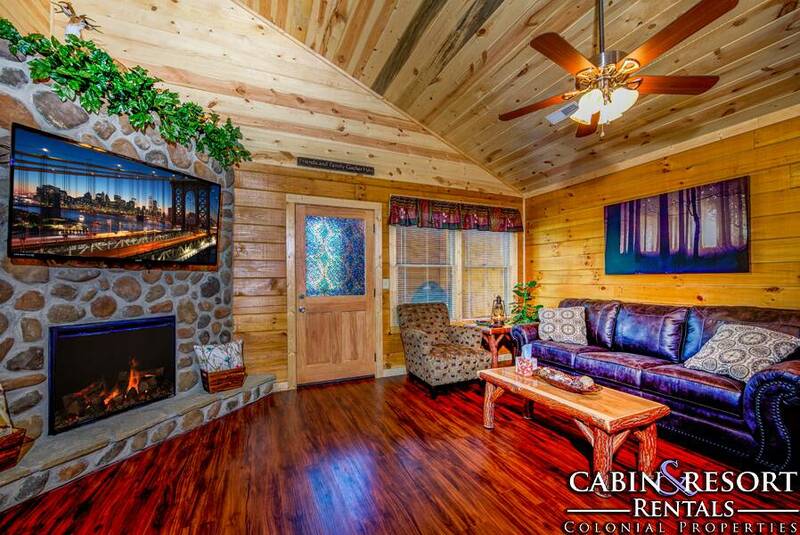 As soon as you enter this beautiful log cabin rental, you’ll be mesmerized by the open floor plan, cathedral ceiling and gleaming natural wood accents that embrace and surround you. 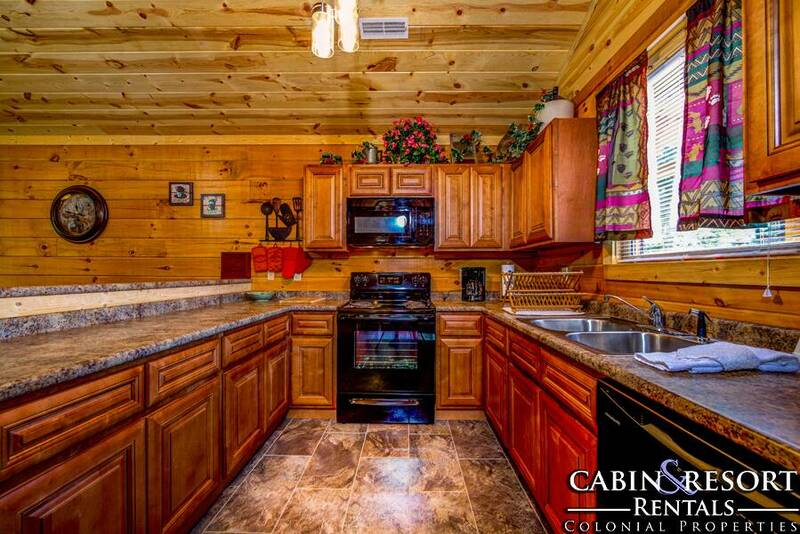 This brand new cabin has all new appliances and new furniture. 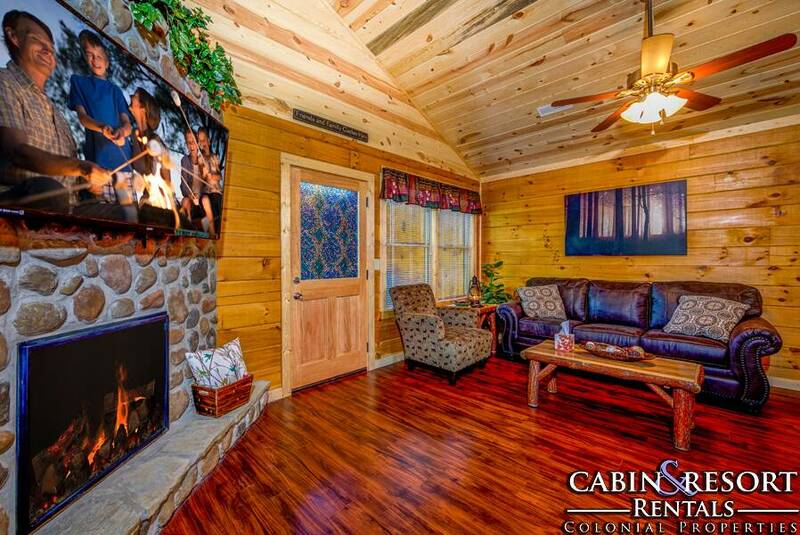 The spacious living room provides you and your guests with comfy seating, a mountain stone accented fireplace, flat screen TV and outdoor deck access. 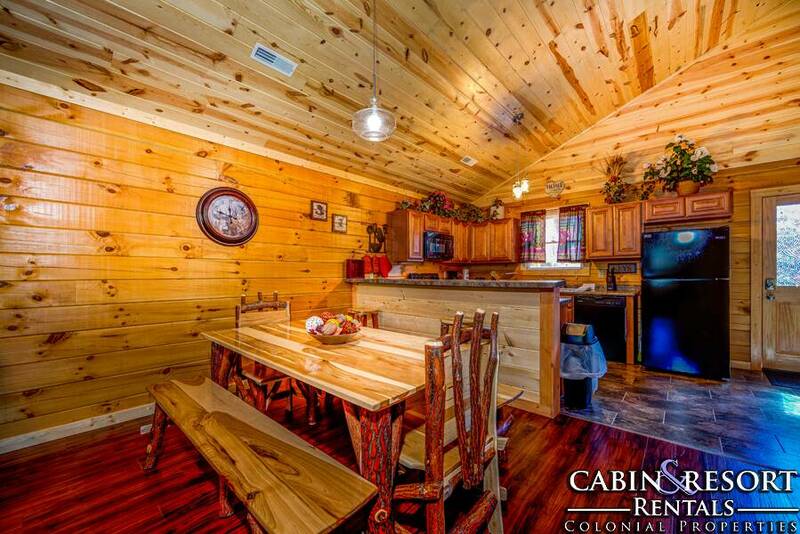 Adjoining the living area is a fully equipped kitchen and dining area that comfortably seats up to 6 people. 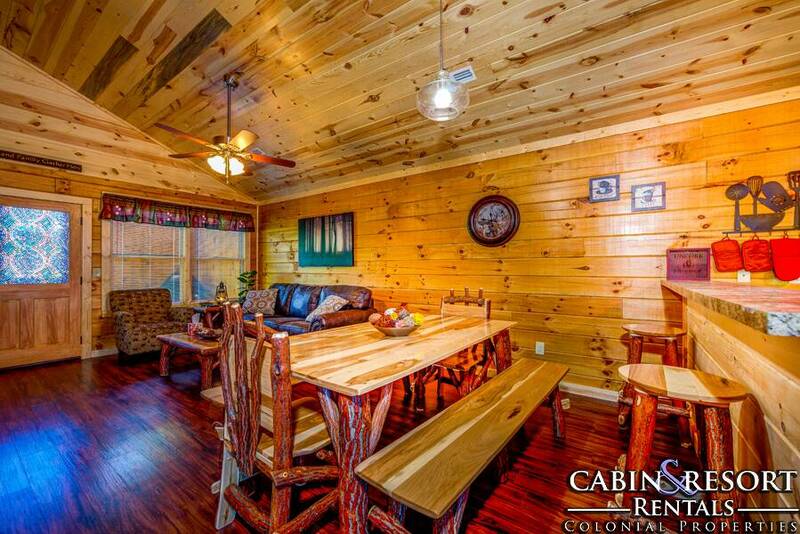 The stunning log dining table offers gleaming wood benches, beautifully crafted log chairs and provides a luxurious feel to this breathtaking cabin. 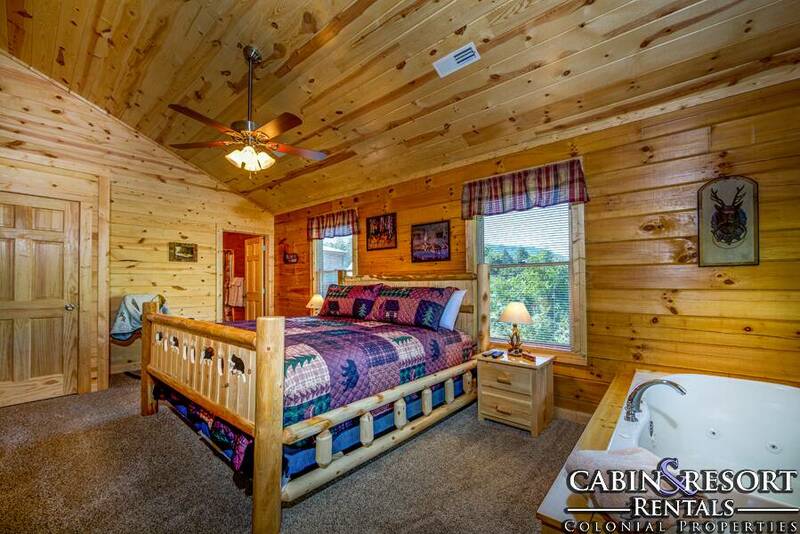 The spacious main level bedroom features a log king bed, flat screen TV, bedside jetted tub and its own private full bath for added convenience. 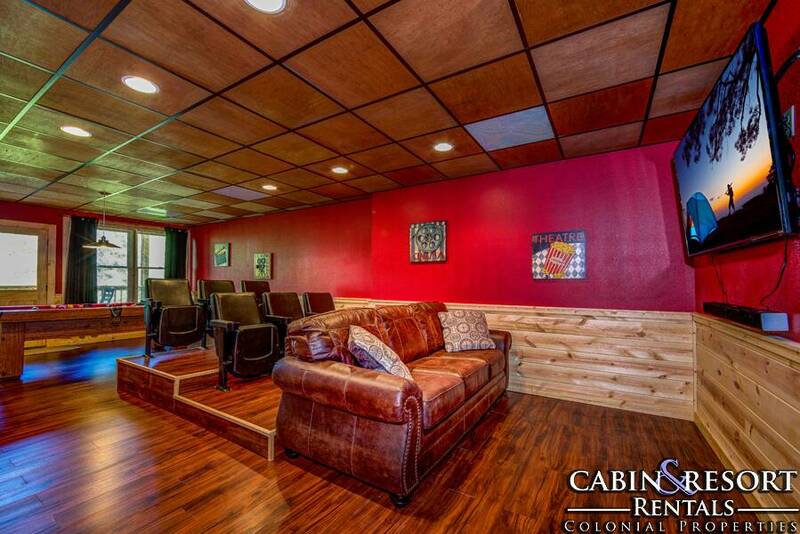 Head down to the lower level at Mountain Movie Inn and you’ll be blown away at the features that await you! 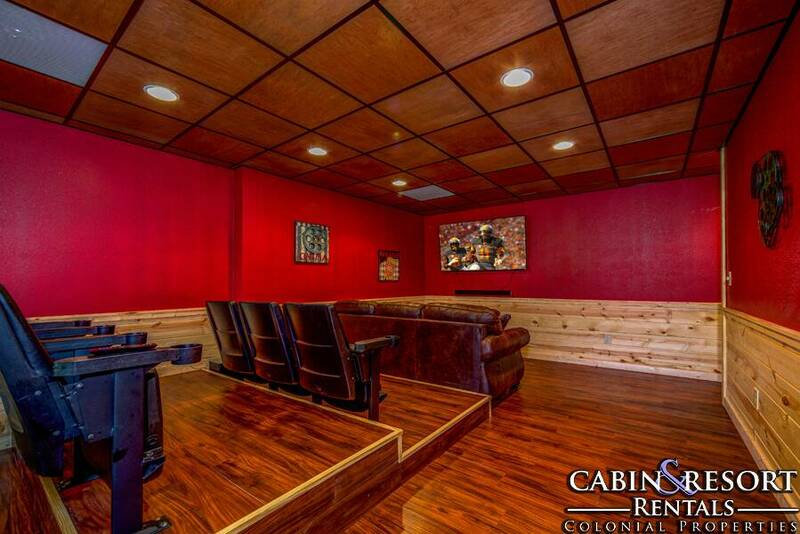 Here you’ll have your very own movie theater, complete with a high definition TV and stadium style seating so that everyone can see what’s playing on the big screen! 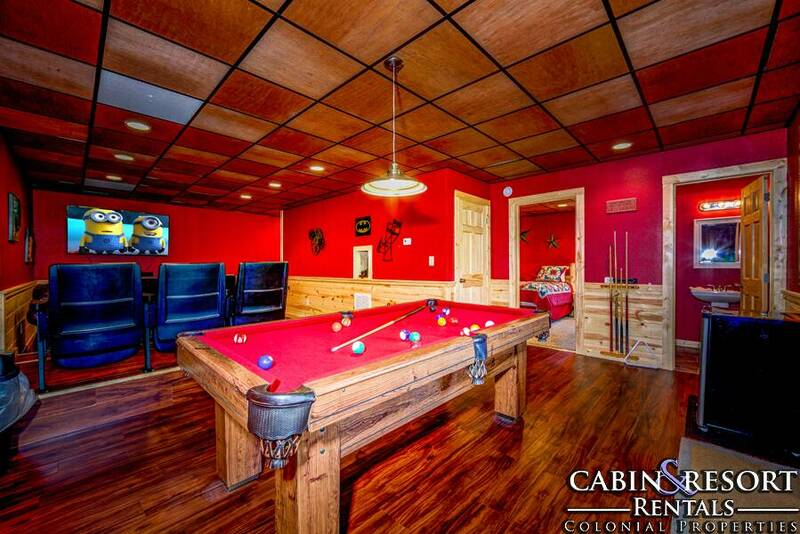 If that’s not enough to keep everyone entertained, head over to the pool table and challenge one another to an exciting and fun game! 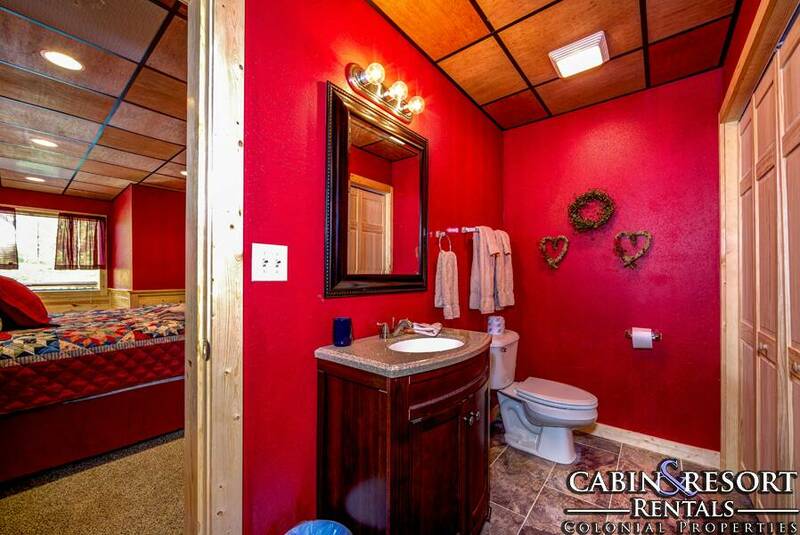 There’s a mini-fridge and half bath located in the theater area for added convenience and enjoyment. Also, the sleeper sofa is located on this level. 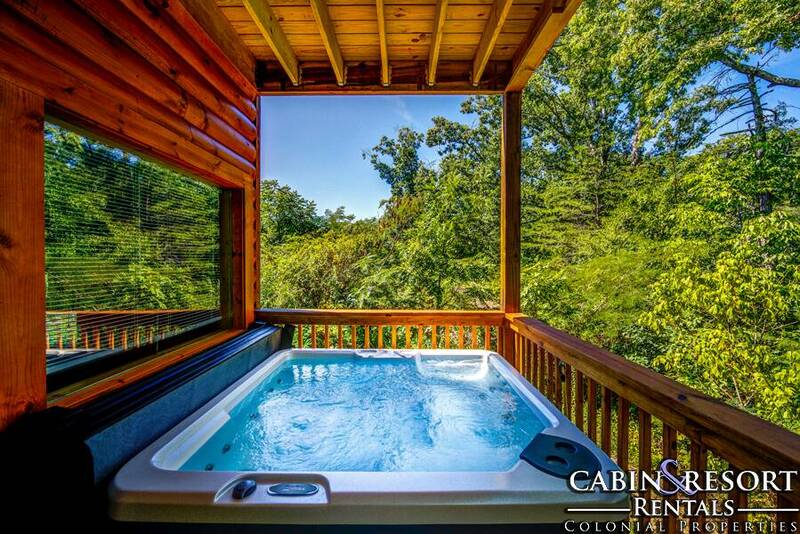 If you’re in the mood to truly relax, step out onto the lower level covered deck and treat yourself to a dip in the soothing outdoor hot tub. 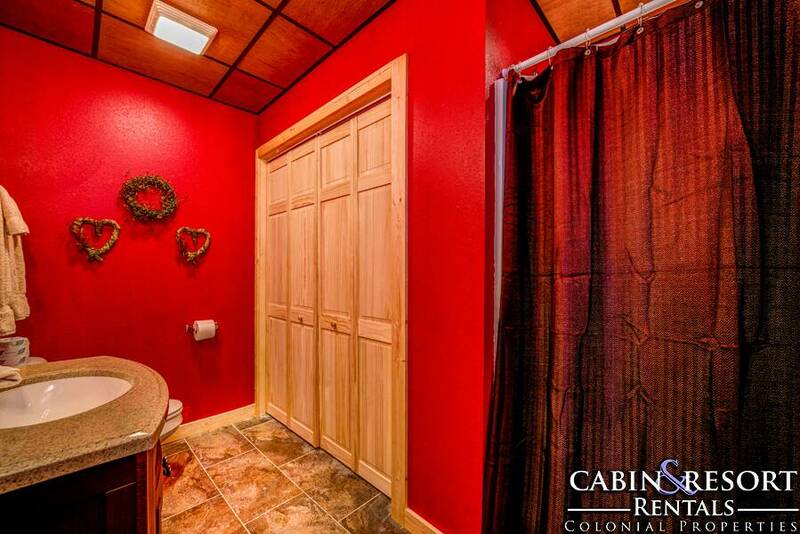 It’s perfect for taking care of aches and pains! 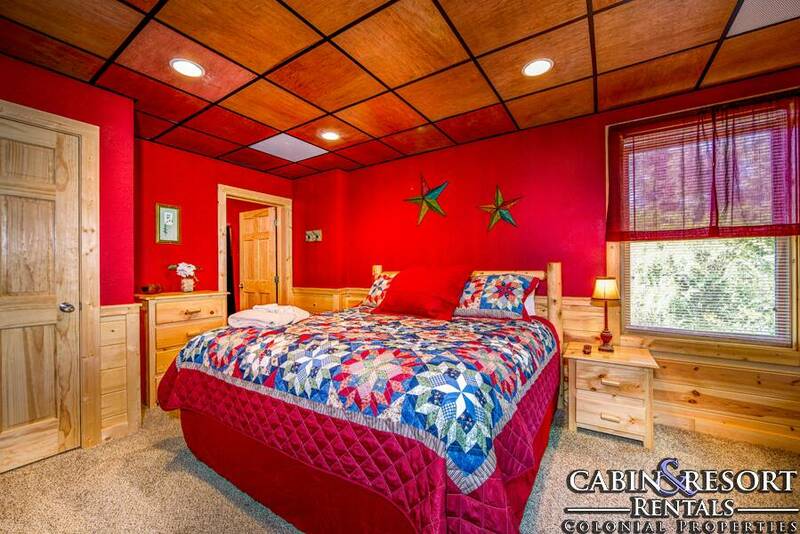 On this level of Mountain Movie Inn you’ll find the second spacious luxurious suite. 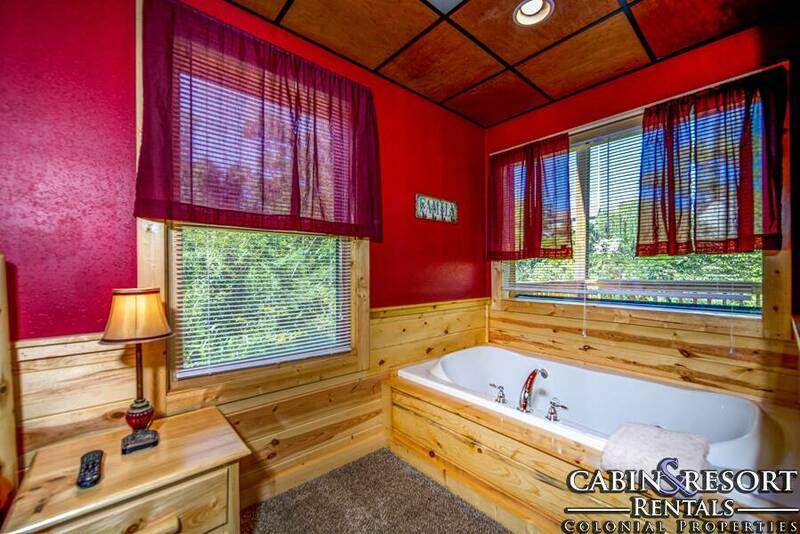 Here you’re once again greeted by a log King bed, flat screen TV, bedside jetted tub and a full bath. 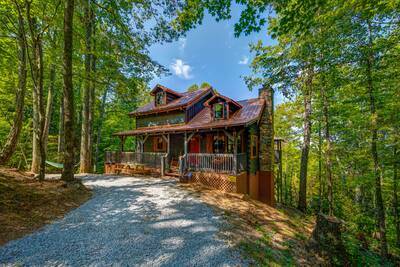 If you’re looking for a Smoky Mountain vacation cabin that will keep everyone smiling and entertained, this is it! 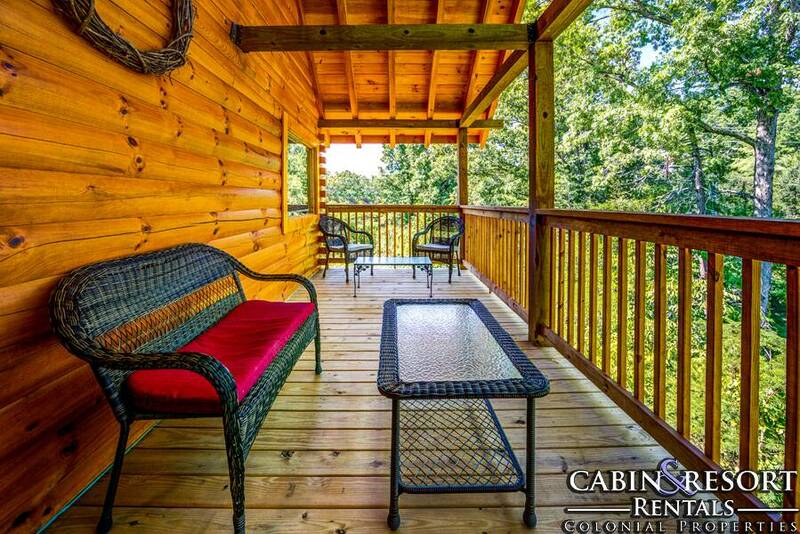 Plan you Pigeon Forge getaway today! 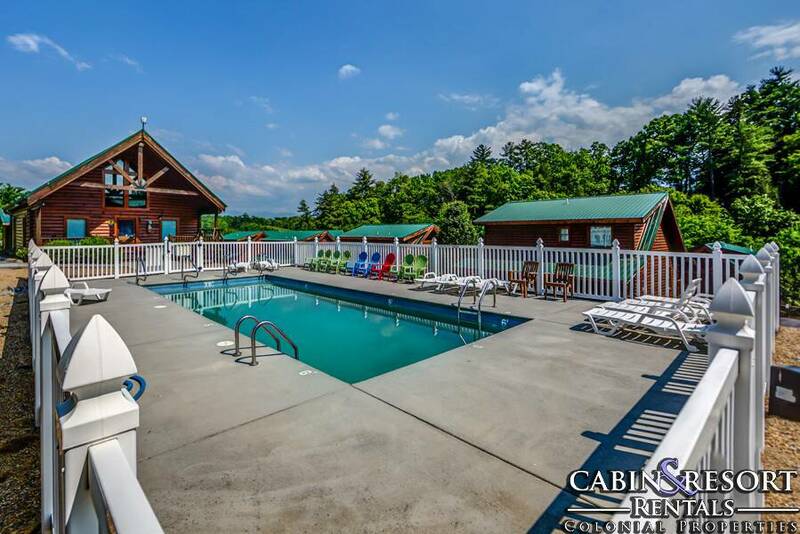 A: Yes, this is located in the Blackberry Ridge Resort and does have seasonal pool access. A: Hey larry, it's 8-10 minutes depending on traffic. 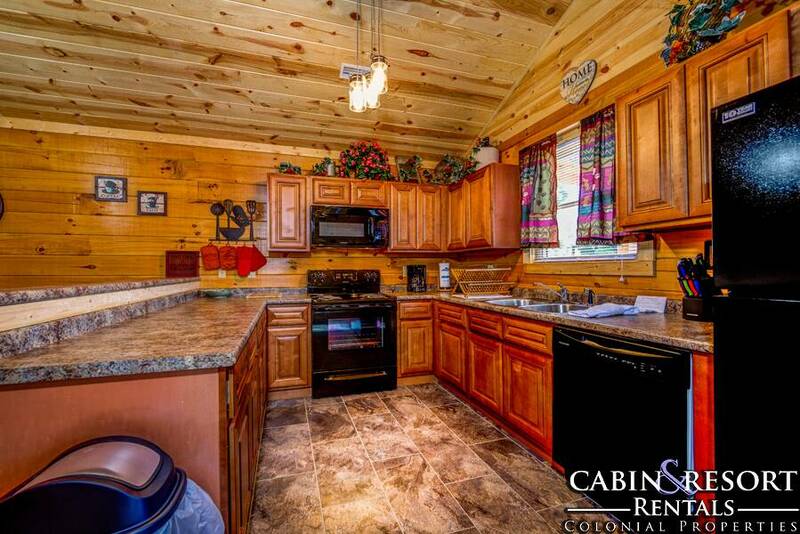 There is a property location map at the bottom of the cabin page that will assist you! A: Outside or on the deck is permitted. A: Hi Barry! 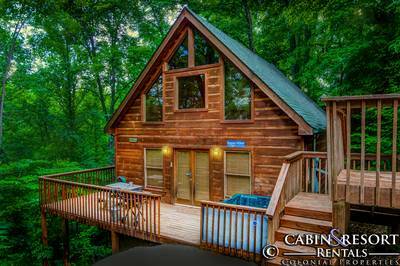 Mountain Movie Inn is located in Blackberry Ridge Resort. A: Hi Sylvia! 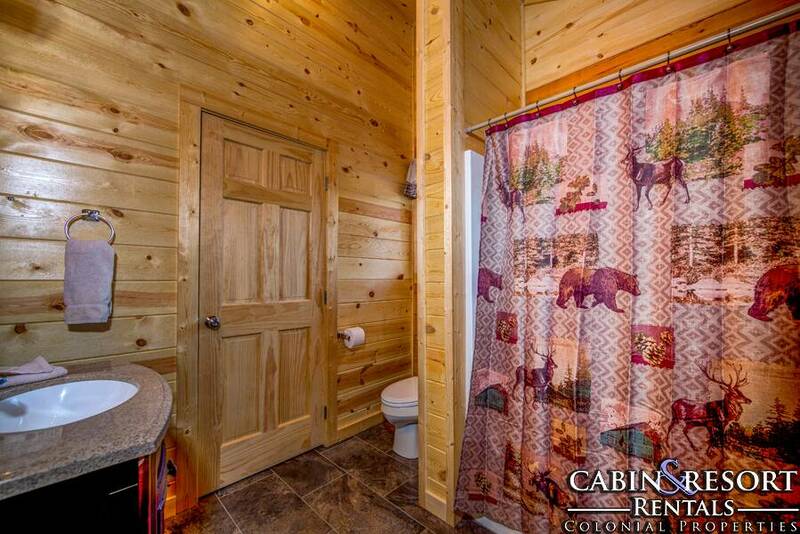 Mountain Movie Inn has a wooded view. A: Hi Kelz! 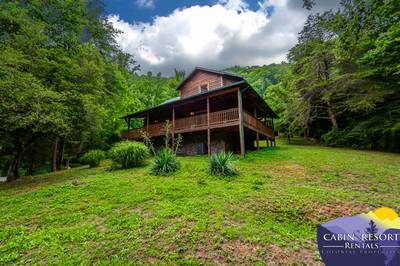 It would not be a secluded location, however great location for going back and forth to town. A: Hi Vickie! 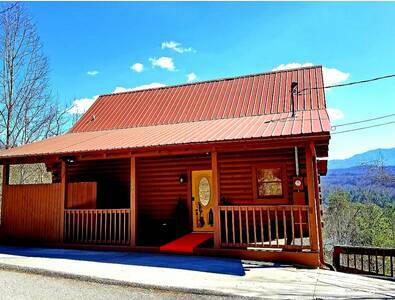 Mountain Movie Inn is located inside a resort with paved roads. 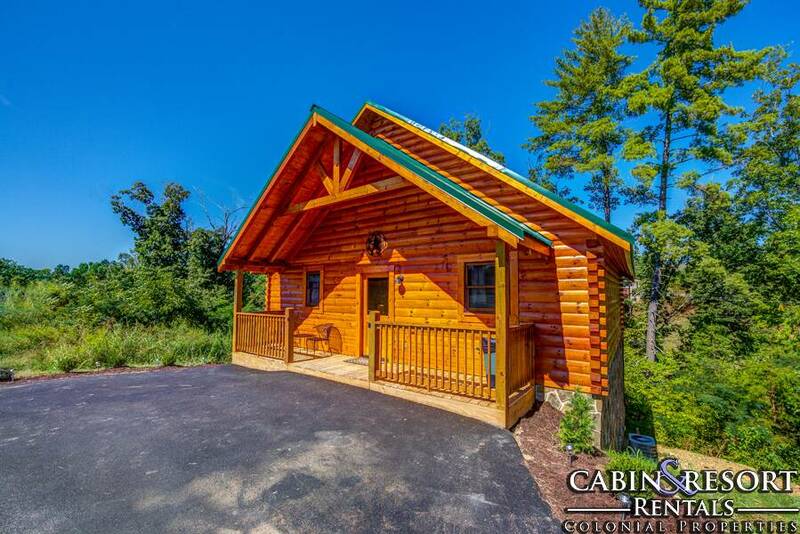 There are 2 parking spaces allocated for this cabin. A: A Queen SS in located in the media room. 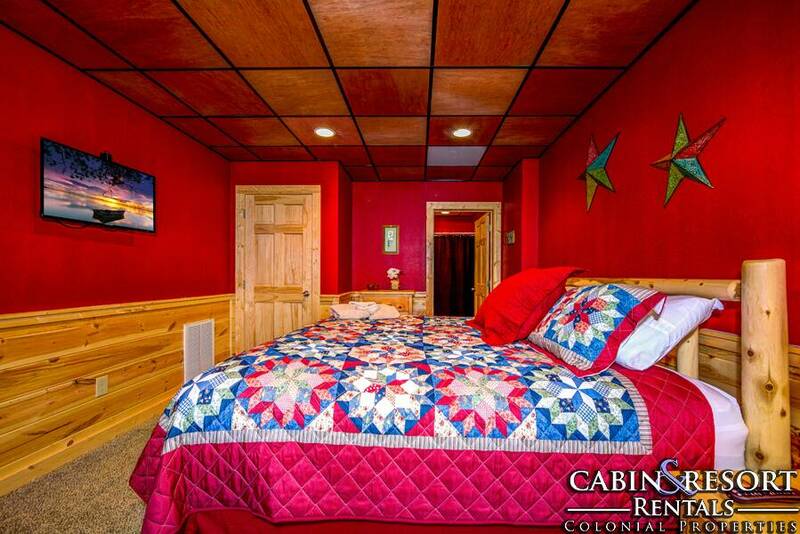 A: Yes, there is one Queen Sleeper Sofa at Mountain Movie Inn. A: Hi Lloyd! Check-In is anytime after 4 PM EST. 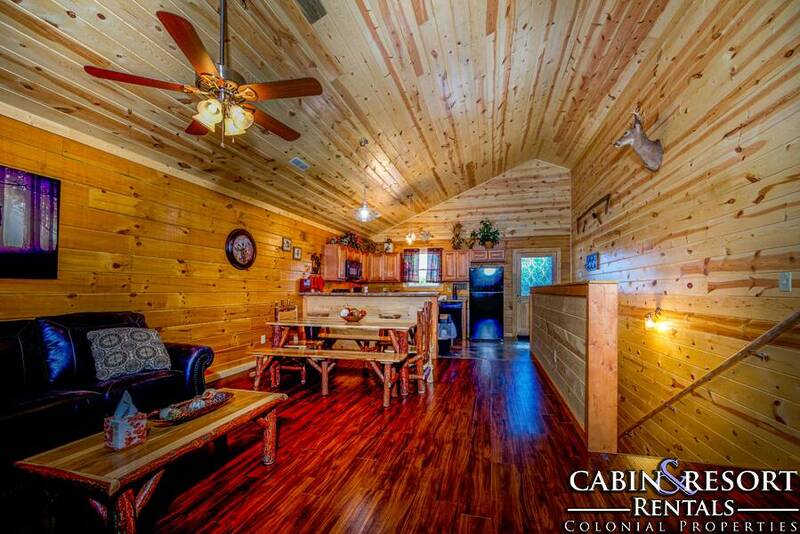 “ Awesome cabin, close to everything. 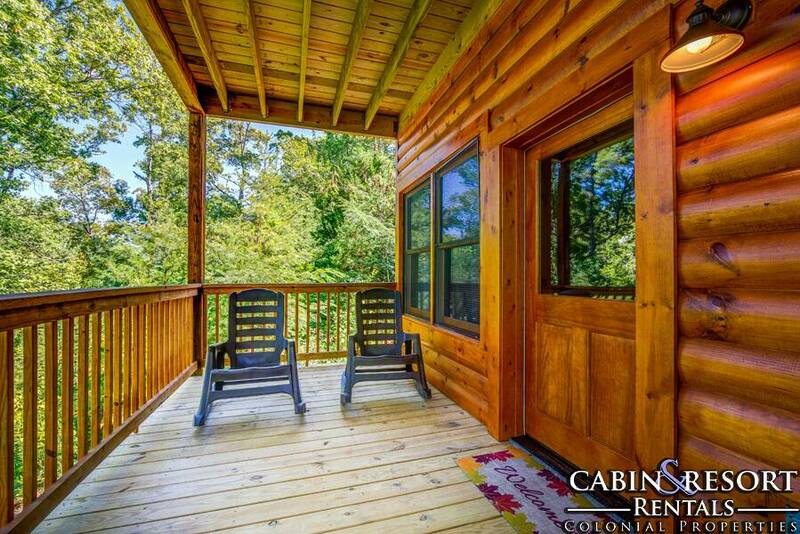 Beautiful view..
“ We loved staying here my kids had an awesome time. 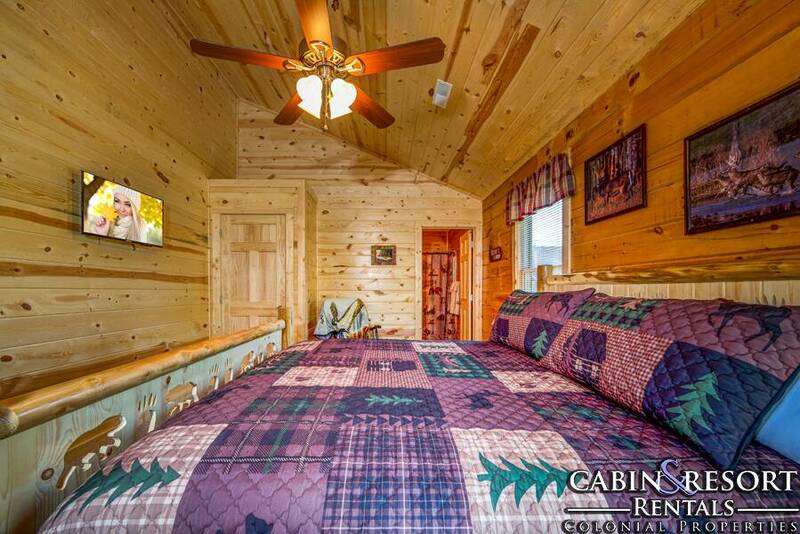 “ The cabin was very very clean, and we enjoyed the comfort of the cabin on our three night stay. 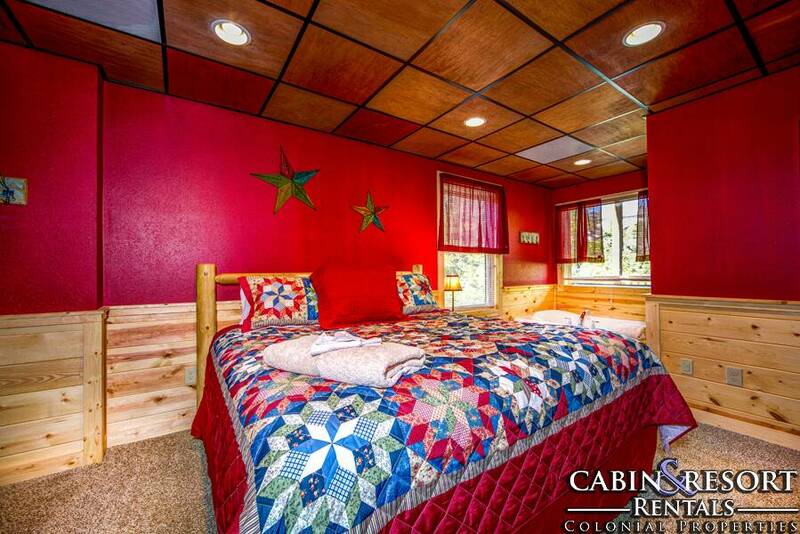 The bed was very comfortable, and the furnishings very welcoming. The dining room table was very nice, and perfect for the four of us. 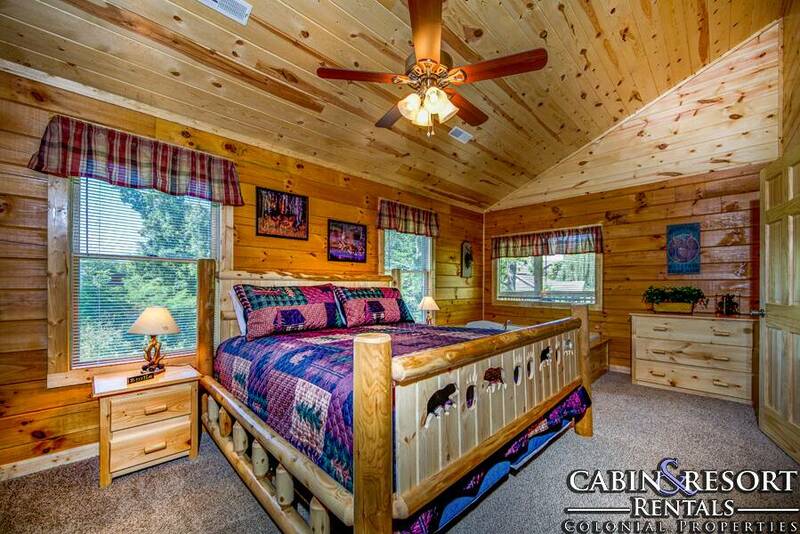 “ We loved the cabin. 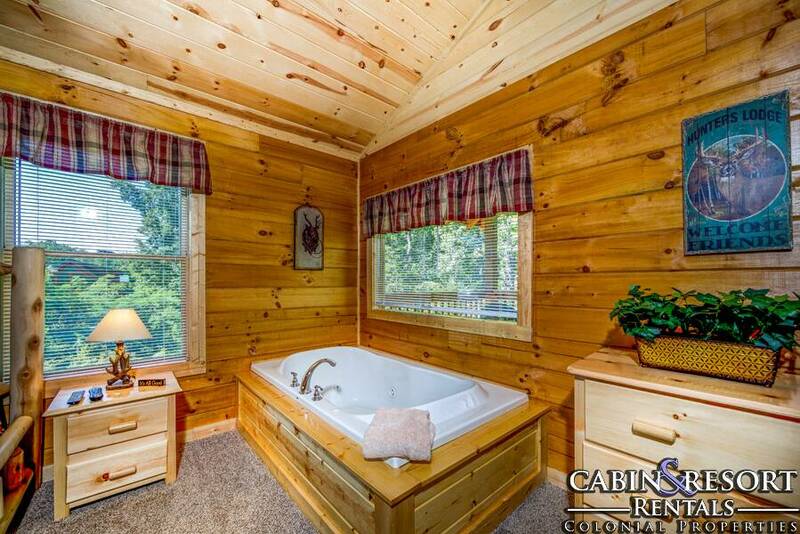 We were looking for a nice clean cabin. The children loved the movie theater. 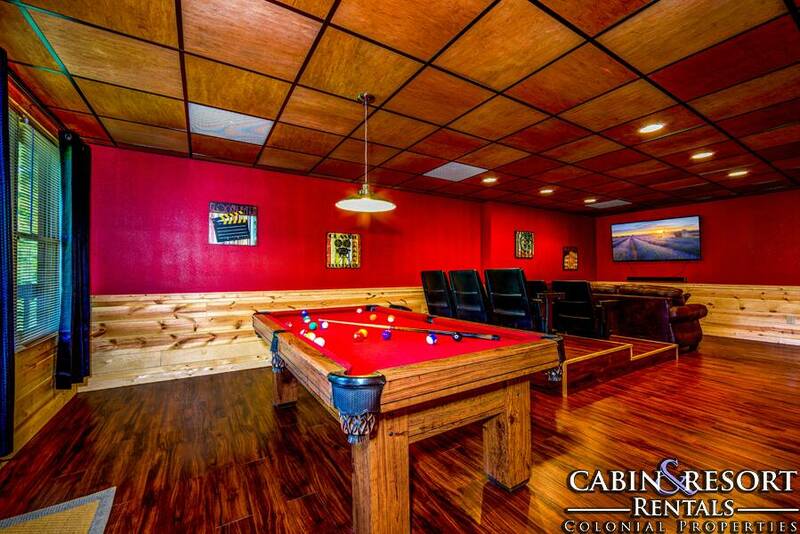 We had no complaints except the pool table had limited room. 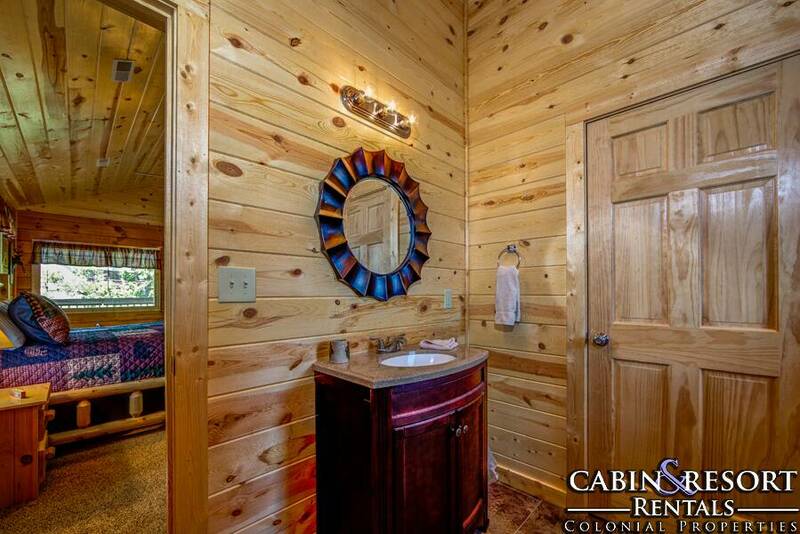 Thanks for sharing your cabin!